By building your own pool table, you have the chance to select all the materials and forms to fit your personal tastes. Instead of using slate, which can be expensive, consider several alternatives according to your needs and preferences. If you are a beginner or if children will be using the table, a less professional material may serve admirably. 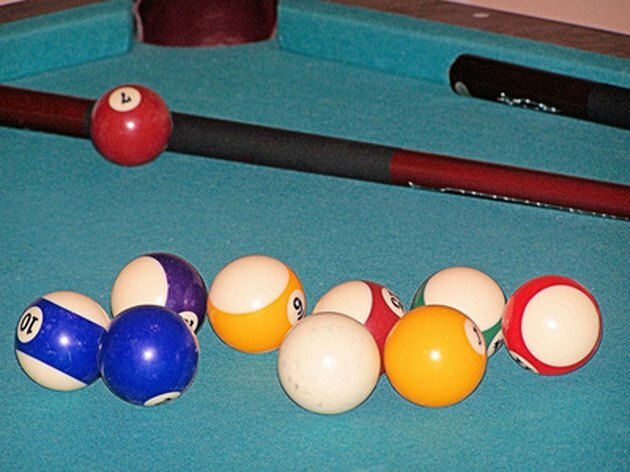 Traditionally, pool tables have a slate surface; however, many alternative materials exist. Medium-density fiberboard (MDF) offers a strong, long-lasting, moisture-tolerant alternative to slate. It is a wood-based composite material made from softwood wood fibers. The individual particles of MDF are far smaller than those found in particleboard, making it a reasonable candidate to replace the smooth slate of traditional pool tables. Several plans for pool tables specify using MDF. BuildaPoolTable.com advises using the material, citing its strength and resiliency compared with its relatively low price. HGTV also specifies MDF in its plans for building your own pool table. Nonetheless, MDF cannot offer the same lifespan or resiliency of slate, making it best for family or amateur play. Another alternative to slate, permaslate is a highly resilient and lightweight option. Permaslate is composed of a type of particleboard sheathed with layers of plastic. It works well for pool tables, as its smooth surface resembles slate and, like slate, it can withstand extreme pressure or shocks. Nonetheless, permaslate may not last as long as a slate table. Permaslate is much lighter than slate, making it easier to work with while building. Often used as an alternative to slate roofing, permaslate comes in 12-by-18-inch tiles, sold in packages of 25 tiles. When sold for roofing, the tiles come with a 50-year guarantee. While the guarantee may not apply when used for a pool table, it demonstrates the resiliency of the material against the elements. An inexpensive alternative to slate, honeycomb tables consist of a stiff honeycomb material sandwiched between two sheets of plastic. Like permaslate, these plastic-based surfaces have the advantage of being lightweight and easy to handle. However, compared with slate, honeycomb may warp or wear over time, compromising the pool table for play. According to HGTV, using a honeycomb layer beneath MDF can help prevent the pool table surface from warping. For their DIY pool table project, they use a combination of the two materials. How Do I Disassemble a Valley Pool Table?